Pam began representing Ellenbecker Investment Group as our Director of First Impressions in July, 2007. She is one of the friendly voices who answers the phone and greets our clients and guests. Pam coordinates client and guest appointments, employee meetings and schedules and she keeps our office running smoothly. She is the person training our new employees on the importance of first impressions. Pam is the foundation for insuring our clients and guests have an extraordinary experience at Ellenbecker Investment Group. 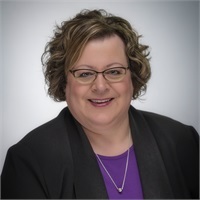 Pam holds a bachelor’s degree in Business and Accounting from Carthage College in Kenosha, Wisconsin. Pam enjoys the Lake Country area and currently lives in Delafield. Some of her favorite activities include walking her dog, gardening, reading, watching HGTV and the DIY Network, crafting, and rooting for the Badgers, Brewers and Packers.